When I moved away from the family, my neighbor Mary, absorbed me into hers, it was a wonderful thing; I had someone to cook with, eat with and gather around the table with. We became fast friends and established our Sunday dinners. Mary had small children and a husband who didn’t care to cook. During the growing season we would go to the farmers market and have a wonderful time preparing our feast. Sam & the kids thought we were nuts, but they came around. Now her children are grown and gone and I’ve moved to another town. The distance might as well be hundreds of miles. Our schedules and lives are so different but we will always stay in touch to the best of our ability and reminisce about those dinners. Mary and I both are glad for our friendship and the influences we had on her children to help them appreciate the impact of food in our lives and the importance of the “family table”. We certainly have learned from the experience. One of our favorite holidays was Thanksgiving. We planned and cooked epic feasts. 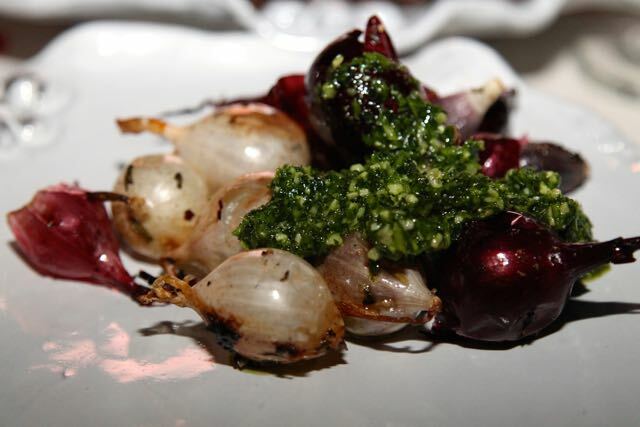 Those days are gone but one of our favorite dishes was always Roasted Onions with Parsley Pesto. Now that I’m married, I have established new Thanksgiving traditions. 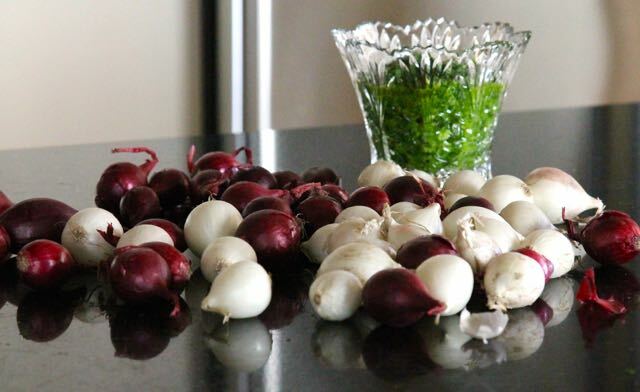 Onions are taboo for two branches of the family, so much so that one of the kids will gag at just the sight of them. Now, I leave them off of the Thanksgiving menu. Granted, it’s only me that it bothers, but sometimes you have to take one for the team. When Sunday Supper posted this event: The Best Holiday Side Dishes, I knew right away what mine would be. I was horrified to find that I have lost the recipe for Roasted Onions and Parsley Pesto so I called Mary in a panic. 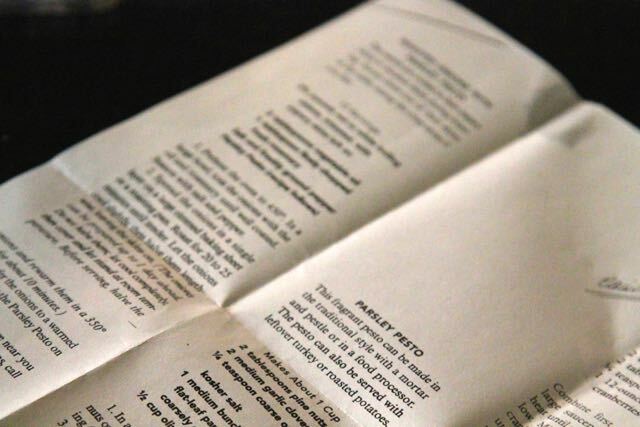 Luckily, she kept the recipe in a binder she had compiled of our favorite dinners. It was lovely for both of us to reminisce about the dinners we enjoyed over the years. We’re planning to get together soon. It turned out to be a good thing I misplaced my recipe. The connection with Mary was a great way to start out the holiday season connecting with friends/family. 1 ½ lbs. red and/or white Boiling Onions*. Preheat the oven to 450 degrees. Trim the root end of the onion leaving the papery skins on the onions (I remove all of the loose skins that are falling off). Add the onions to a bowl and toss with the Olive Oil and Rosemary, then season with salt and pepper. Spread the onions on a baking sheet covered with foil or parchment paper and roast for 20 – 25 minutes until tender. Meanwhile, make the parsley pesto: Spread the pine nuts in a small skillet or baking disk and toast in the preheated oven until brown but not burnt, about 5-7 minutes, shaking the pan occasionally. Remove from the pan immediately and cool. 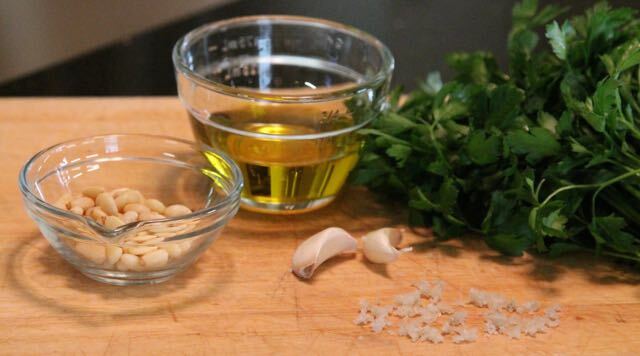 In a blender or food processor add the parsley, garlic, and cooled pine nuts along with a few tablespoons of the olive oil. Pulse until combined, scrape down the sides then turn on the blender/processor and add the remaining olive oil in a steady stream, process until smooth. Taste and season with salt and pepper. Transfer to a serving bowl. 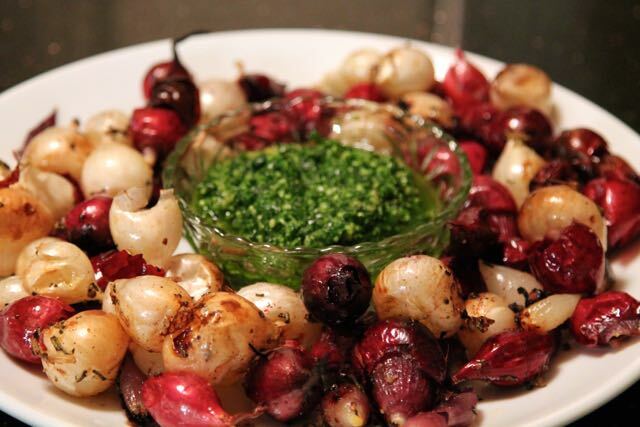 Transfer the onions to a warmed platter and serve with the parsley pesto. ••I’ve enjoyed this with small red onions or sweet onions such as Vidalia halved and trimmed flat on the bottom. Increase the roasting time to 35-45 minutes until tender. 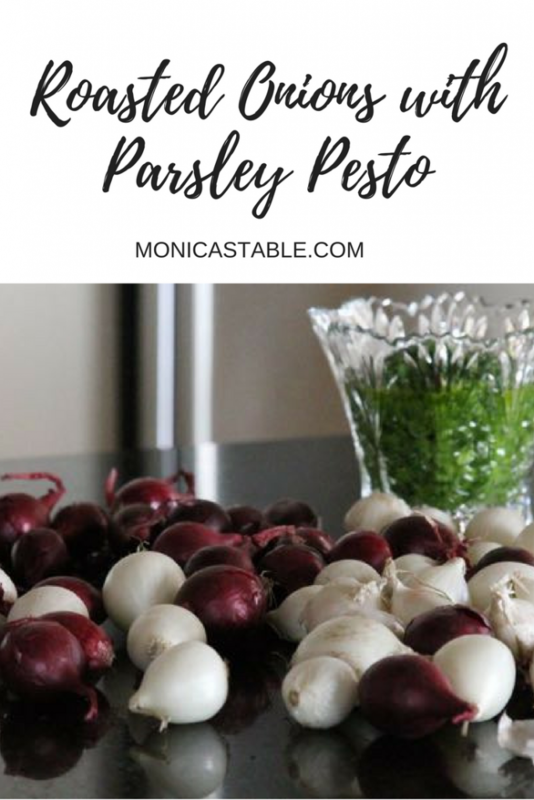 ** The parsley pesto can be made a day in advance. Seal it in an airtight container and refrigerate. Bring to room temperature, stir and reseason before serving. I’m loving all of the Holiday side dishes posted by the Sunday Supper family. I’ll be trying most of them this season!!!! Our event hosts go above and beyond the call of duty. 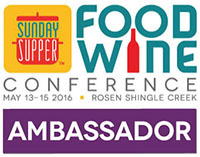 Special thanks to Caroline Williams from Caroline’s Cooking for hosting this event! 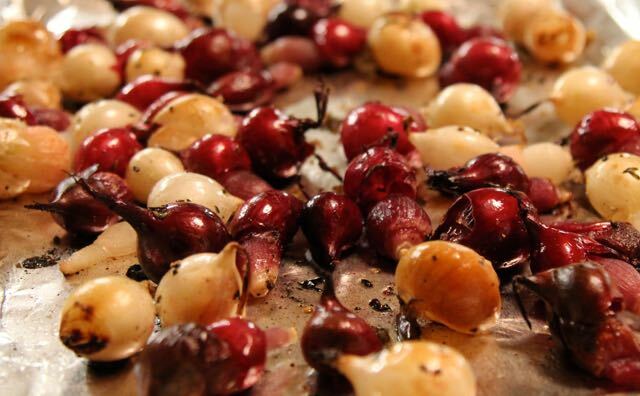 I love roasted onions—I always pull more than my share out of a pan of roasted veggies! 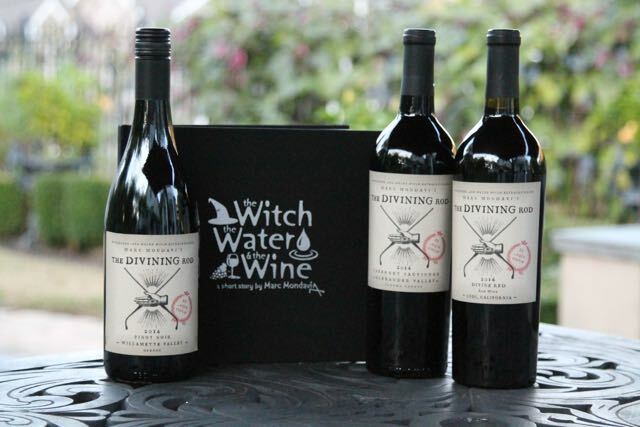 Pairing with parsley pesto make these perfect for a celebratory meal! I could eat onions like apples, and roasted, OMG! I can’t get enough. These are so cute with the mini onions. I wish someone would keep track of my recipes! This sounds like such a yummy dish. So nice to have friends like this! I have never tried roasting onions before, but I bet they are fantastic. I am always looking for new recipes to add to my Thanksgiving menu – I think I have found one. Oh, this sounds like a unique and tasty dish! I’ve never roasted onions as a side dish by themselves, but now I can’t wait to try it.